Location: Najac, in the Aveyron departement of France (Midi-Pyrenees Region). Notes: Château de Najac is a former royal fortress, which stands on the town of Najac in the Aveyron department in Languedoc-Roussillon region Midi-Pyrénées to the western boundary of Rouergue, the borders of Quercy and the Albigensian. It was built between 1253 and 1266 by Alphonse de Poitiers, brother of Louis IX, on the foundations of an ancient castrum, and its Romanesque keep, built around 1100 by Bertrand de Saint-Gilles, son of Raymond IV, Count of Toulouse . The remains of the castle and its second chamber are subject to a classification as a historic monument by decree of July 3, 1925.And 960-980 to about 990, is reported Bernard Najac; Bernadus Najacensis and Najago. The presence of a family says Najac is still attested in the twelfth century on the site. They would share their rights with local lineages whose Cadoule (Cadoillia) and Gros. The castle is meanwhile mentioned for the first time at the end of the eleventh century in a passage from the book of Saint Foy miracles (Liber Sancte miraculi Fide) that evokes a castellum called Najac (castellum rusticorum lingua dictum Nagiacum). After 1112, the place that holds a lock position of Lower Walk Rouergue is strongly reinforced by the counts of Toulouse after the latter had made a division of their rights; what will be the Viscount of Millau and Rodez County passed to the Counts of Barcelona. In 1141-1142, Alfonso-Jordan, Count of Toulouse, was beaten by Roger Trencavel Viscount of Carcassonne, in the Southern Great War (late eleventh century, late twelfth century). Knights and coseigneurs Najac like the Viscount Bruniquel, Lautrec, St. Antonin and the lords of Villemur are part of the network that have made the Trencavel. In 1152 and 1162, in acts on the castrum quod vocatur Verdun, Gaubert Najac witnesses the Viscount Raymond Trencavel. 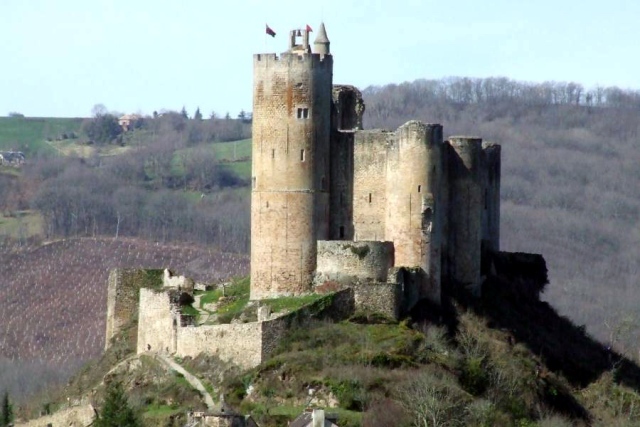 In February 1182 (New Style), the Count of Toulouse Raymond V is authorized by the King of France to hold in fief of increase, the castles of Najac and Posquières (Vauvert). April 14, 1185, is found in Najac Richard the Lion Heart and Alfonso of Aragon in order to conclude a treaty of alliance against the Count of Toulouse during the conflict between the Trencavel at the time, Aragon and Plantagenet to the counts of Toulouse.